JUCHEREAU DE SAINT-DENIS, LOUIS, explorer, trader, officer in the colonial regular troops; b. 17 Sept. 1676 in Quebec, son of Nicolas Juchereau* de Saint-Denis and Marie-Thérèse Giffard; m. late 1715 or early 1716 to Emanuela Ramón de Navarro; d. 11 June 1744 at Natchitoches, Louisiana. Little is known about the early life of Louis Juchereau de Saint-Denis. The story that he was educated in Paris cannot be documented, but, as he was a member of a network of important Canadian families, it is not unlikely. 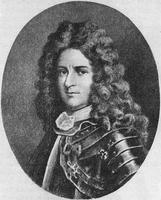 In 1699 he accompanied Pierre Le Moyne* d’Iberville, to whom he was related by marriage, on Iberville’s second voyage to Louisiana. He remained there and with Bienville [Le Moyne] in 1700 and 1701 made some explorations in the region between the Red and Ouachita rivers. In 1702 or 1703 he received command of the Fort du Mississipi (18 leagues from the river’s mouth), a position he held until the abandonment of the fort in 1707. During these years he is said to have been as far north as the mouth of the Ohio, where he briefly took charge of a tannery established by his brother Charles*. He also made a number of journeys westward into the present state of Texas, trading and exploring. At some time after 1707 he settled on the Rivière d’Orléans (Bayou St John) as a landowner and trader. In 1713 the new governor of Louisiana, Lamothe Cadillac [Laumet*], appointed him leader of an expedition to seek a trade route to New Spain. The choice was a good one, for Saint-Denis was an experienced traveller in the often hostile lands west of the Mississippi and a talented diplomat who spoke the Indian languages of the area. 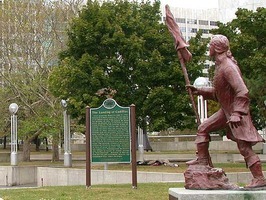 He went up the Red River to the vicinity of present Natchitoches, Louisiana, where he established the post of Saint-Jean-Baptiste des Natchitoches on an island. Continuing across Texas he stopped to trade with Hasinai Indians (the Caddo confederacy) and may even have returned to Louisiana for more goods. He arrived at the Spanish garrison town of San Juan Bautista (Piedras Negras, Mex.) in July 1714. The commandant, Diego Ramón, detained the party while he awaited instructions from his superiors. Saint-Denis used the time to court Ramón’s granddaughter, Emanuela. In the spring of 1715 he was taken from San Juan Bautista and sent to prison in Mexico City. During the time of his imprisonment the Spanish authorities decided to occupy Texas and they accepted his offer to guide a party being sent to that region to establish missions. On the way, Saint-Denis stopped at San Juan Bautista late in 1715 or early in 1716 to marry Emanuela. Then, leaving her behind, he set out eastward with the priests and soldiers (including several of the Ramón family). Four missions were founded, the easternmost in the neighbourhood of Nacogdoches (Tex. ), less than 100 miles from Natchitoches. By August 1716 Saint-Denis was back in Mobile (Ala.). Although the Spaniards were not prepared to countenance trade between Louisiana and New Spain, Saint-Denis apparently foresaw a profitable future in smuggling. He raised all the money he could and, with several associates and his goods on a mule-train, set out for the Rivière du Nord (Rio Grande). Word of this bare-faced contravention of Spanish law leaked out, however; when the party arrived at San Juan Bautista, Ramón was obliged to impound the merchandise. Saint-Denis went to Mexico City to try to arrange to get it back. By July 1717 he was in prison again. After several months he was released, with permission to sell his goods but with orders never to return to Texas. 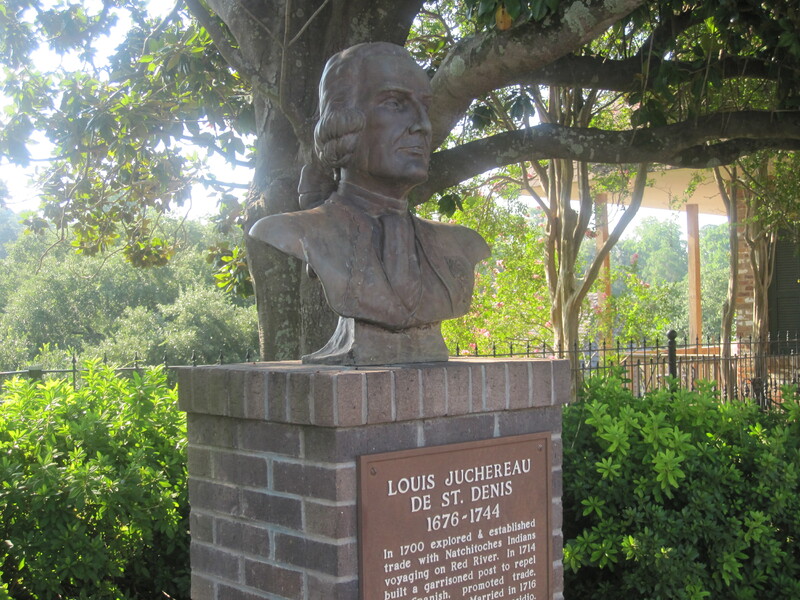 He arrived back in Natchitoches in February 1719. His wife either accompanied him or came soon after. When France and Spain went to war in 1719 he fought at the defence of Mobile that year and in the second French capture of Pensacola (Fla.). He had resigned from the colonial regular troops some years before; on 3 Mar. 1720 he re-entered them with a lieutenant’s commission and a few months later he was given command of the Natchitoches area. During the winter of 1720–21 Spanish sources reported that he was organizing Indians west of the Hasinais. In the spring of 1721 the Compagnie des Indes, now responsible for Louisiana, granted him a five per cent commission on goods sold to foreigners, since it was eager to promote trade with the Spaniards in Texas. France and Spain were at peace after May 1721 and this trade was contrary to Spanish law, but the Spaniards had established Los Adayes (near Robeline, La. ), just 15 miles west of Natchitoches, as the capital of Texas. It was far from a legal source of supply and business flourished. Saint-Denis found time apart from his military and commercial activities to manage his estate – he claimed local vines would produce wine as good as that of France – and to conduct the delicate diplomacy with the Indians that was necessary to keep the peace on the frontier. Not all the French were as tactful as Saint-Denis. The commandant at Fort Rosalie (Natchez, Miss. ), having tried to dispossess the local Natchez village of its land, provoked the tribe into an uprising against the French in 1729. The Natchez captured that post in 1731. Those of the tribe who had moved to the neighbourhood of Natchitoches were massacred by Saint-Denis’s garrison with the help of some Spaniards. Saint-Denis lived at Natchitoches in considerable luxury, but in 1741 financial difficulties dating in part from his journeys to New Spain began to plague him. He was obliged to acknowledge a debt of 18,361 livres to the former Compagnie des Indes. He was reduced to straitened circumstances, and a mood of disappointment, quite unlike the ebullient optimism that had previously governed his life, settled on him. “Happy is the person who can leave [Louisiana], and happier is he who never came here,” he wrote in April 1741. In January 1744 he requested relief from his command and permission to move with his family to New Spain, but in June he died. He was buried in the Natchitoches church. Despite his colourful career Saint-Denis seems to have been little involved in the bitter internal political controversies of Louisiana. He gained the respect of the French, the Indians, and the Spanish missionaries in Texas. Spanish officials breathed a sigh of relief at his demise; their reaction is perhaps the best measure of his contribution to French Louisiana. Cathedral of the Immaculate Conception (Natchitoches, La. ), Registres des baptêmes, mariages et décès de la paroisse des Natchitoches. [André Pénicaut], Fleur de lys and calumet: being the Pénicaut narrative of French adventure in Louisiana, ed. and trans. R. G. McWilliams (Baton Rouge, 1953). “Natchitoches and the trail to the Rio Grande, two early eighteenth-century accounts by the Sieur Derbanne,” trans. and ed. Katherine Bridges and Winston De Ville, Louisiana History (Baton Rouge), VIII (1967), 241–42. DAB. J. F. Bannon, The Spanish borderlands frontier, 1513–1821 (New York, 1970). Ross Phares, Cavalier in the wilderness, the story of the explorer and trader Louis Juchereau de St Denis (Baton Rouge, 1952). P.-G. Roy, La famille Juchereau Duchesnay (Lévis, Qué., 1903). in collaboration with Winston De Ville, “JUCHEREAU DE SAINT-DENIS, LOUIS,” in Dictionary of Canadian Biography, vol. 3, University of Toronto/Université Laval, 2003–, accessed April 21, 2019, http://www.biographi.ca/en/bio/juchereau_de_saint_denis_louis_3E.html.